It's been a busy week, but no time really for taking photos, so this week's shot comes from September 2005, when I was in Snowdonia, and I had my first DSLR, the Pentax *istD. At just 6 megapixels it might seem a bit lacking by today's standards, but it was this camera that very quickly made me realise I was done with film, and many of the shots I show in workshops and on the TV in Cameraworld, Chelmsford were taken with it. This one I came across when I was sorting through photos in order to update the TV display in Cameraworld, and I was reminded how much I liked it. 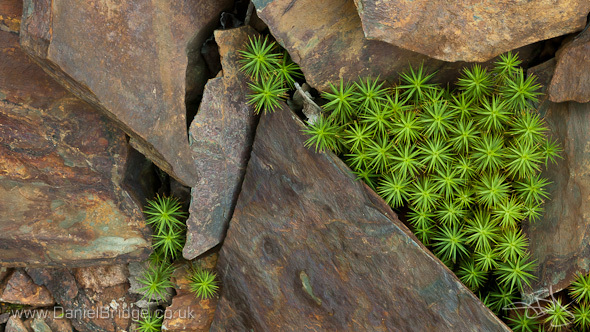 For me contrast is often the essential element in a shot, and here it's in the form of textural contrast - the soft yet spiky moss against the hard and smooth(ish) rock, with a striking colour difference too. Pentax *istD, Pentax A 50mm f/1.7 lens + extension tubes @ f/13, 1s, ISO200, tripod.